The Scotch Bonnet pepper has a sweeter flavour and stouter shape, distinct from its habanero cousin with which it is often confused. Scotch Bonnet chile peppers ripen from green when immature to varying shades of yellow, orange and red when fully mature. 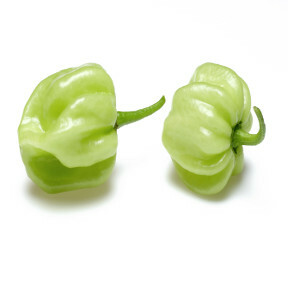 A petite pepper the Scotch Bonnet is short and squat with an irregular shape. Their skin is glossy and thin with slight exterior wrinkling. Known as one of the hottest peppers in the world the Scotch Bonnet offers a smoky pepper flavor with floral and tropical fruit aromatics. Handling: Scotch Bonnet chile peppers are utilized to add heat and a spicy flavor to foods. Add whole pods to stews, curries, rice dishes and stewed preparations such as oxtail soup or fricasseed chicken. Use caution though not to let Scotch Bonnet chile pods burst or you run the risk of adding too much heat to the dish.